We invite you to a Rendezvous and Regatta to celebrate the Thunderbird in its ancestral home, in the tradition which began at the Center of Wooden Boats of Seattle. This is a great opportunity to enjoy the company of Thunderbird sailors with the goal to have fun in a low key competitive event. It is also the ideal jumping off point for a South Sound Cruise, the unknown “San Juans”. FEES Entry fee is $65.00. This includes beer and pizza Friday night, two dinners for Saturday night, continental breakfast Saturday and Sunday and moorage. Additional dinners may be purchased for $15. Moorage will be at a pier Northwest of the Gig Harbor Boat Shop. The Boat Shop will provide ferry service and a dinghy would be helpful. SAILING INSTRUCTIONS The Sailing Instructions will be available at the skippers meeting. THE COURSES The courses will be given in the SI and could include: Saturday: buoy racing inside Gig Harbor. 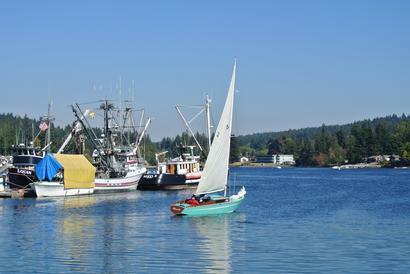 Sunday: “Long Distance Race” from Gig Harbor to a mark North of Gig Harbor in Colvos Pass. PRIZES Prizes will be awarded commensurate to the number of boats in each class, and will consist of Ed’s model T-Birds. If you don’t have one here is your chance. DISCLAIMER OF LIABILITY ompetitors participate in the race entirely at their own risk. See RRS Rule 4, Decision to Race. The organizing authority will not accept any liability for material amage or personal injury or death sustained in conjunction with or prior to, during or after the race. 13. INSURANCE 13.1. Each participating boat shall be insured with valid third-party liability insurance.